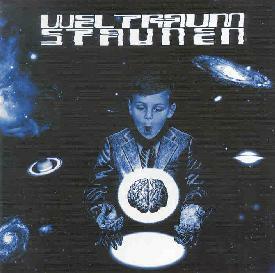 Weltraumstaunen is a heavy space rock band from Germany that shares members with Zone Six and Liquid Visions. The CD includes 5 tracks and is mostly instrumental. "Pollenflug" opens the set and defines the bands sound as heavy driving space rock with the emphasis on the ROCK. This song sounds like it would have fit perfectly on the first Omnia Opera CD (a space rock classic in my opinion). The guitar/bass/drums trio are at the center giving the music it's ROCK base, but the guitars trip out beautifully and synths are present for extra cosmic embellishment. On "Clockline" the music begins slower and trippier, and we're treated to a gorgeous female voice. But things very quickly transition to a chaotic freakout segment before settling into a cosmic rockin groove. Lots of killer bubbling space guitars and blazing rock that once again remind me of Omnia Opera. An excellent tripped out psychedelic space jam. When I heard the first guitar notes of "Kraut" I thought for sure this would be a cover of Pink Floyd's "Echoes". But no, the band embark on a psychedelic journey that combines Indian ragas, shimmering guitar lines, and a potent bass that sets a simple, almost dancey rhythmic groove. Very atmospheric and hypnotic mantras for the mind. "Astonished ...Like The Universe" is a 21 minute epic that recalls the Pink Floyd Ummagumma days. Very much a headphones tune, the music trips along slowly with little concern for direction or destination. Very nice if you just want to relax and meditate in another dimension. But around the 15 minute mark vocals are introduced and the music develops into a full band rock jam. "Last Flight" closes the set and is a nice spacey tune that is credited as being about 5 minutes in length but is actually 22 on the CD. So I played the game and listened through the silence until about the 20 minute point when a droney looped bit comes in to finish out the last couple minutes. Yeah, big deal. In summary, this is an excellent heavy space rock album that all AI readers will enjoy. Grab it. You'll love it. Nuff said. Sysyphus Records is run by the folks who publish the Pink Floyd magazine Eclipsed. You can visit their web site at: http://www.eclipsed.de.